Relax with a cocktail while you enjoy a refreshing swim and the spectacular views. Gather the golfers in your crew and head to the Kapalua Golf Course for a friendly game. Treat yourself to a facial, massage or manicure - or all three! Spacious condos give you plenty of room to spend quality time as a family. With a children's pool and play area, and kid's programs, the little ones will be endlessly entertained. It's only a 5 minute walk to the onsite Kapalua Golf Course. Kapalua Golf Club Bay Course is a 5 minute drive from the resort. You're surrounded by beautiful golf courses and a spectacular view of Fleming Beach. If your crew has a taste for the finer things in life, then the Ritz-Carlton Kapalua resort won’t disappoint. You’ll feel like you’re staying on a secluded private island thanks to a peaceful property with pristine beaches and chic, upscale suites. Wow your crew by booking an oceanfront unit and enjoy breathtaking views of the Pacific Ocean from your private lanai (aka a balcony, for you mainlanders). It’s a setting so scenic, your Instagram followers will wonder if your pics are even real. If you’re weary from the flight, swap your traveling clothes for a plush terry robe and take a power nap on the feathertop mattress. But don’t be surprised if the kiddos are begging to hit the beach the minute you arrive. Good thing it’s just a two-minute walk to beach. You can relax and work on your tan while catching up on your book club’s pick, or stay active with fun aquatic activities like snorkeling or standup paddle boarding. Come mealtime a well appointed in-suite kitchen gives you the option of cooking up your crew’s favorite dish. Not in the mood to cook? No shame – you’re on vacation! Take advantage of the 24-hour room service, (dessert encouraged). One- and two-bedroom suites at the Ritz-Carlton Kapalua are airy, modern and chic. Soft white walls and elegant darkwood combine with subtle island-inspired décor to create an inviting oasis. Fully equipped kitchens with marble countertops and stainless steel appliances will inspire the inner chef in anyone – try out a new recipe and hold a DIY dinner party for your crew in the dining area. Spacious, inviting living areas with ample seating and flatscreen TV make a great space for quality time with the crew. Open up the door to your private lanai to admire postcard views and let in an ocean breeze. Everyone has fun in Hawaii – that much is a fact. Maui was named the Best Island (like, in the world) by Condé Nast Traveler for 19 consecutive years! The island’s natural beauty plays a big part in that. 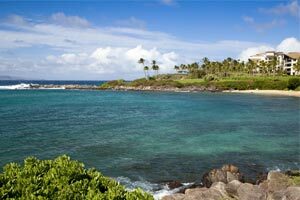 Go hiking through lush jungle, snorkel around in warm, tropical waters, or just relax on the beach. Take a few strokes off your game at one of two walkable golf courses. There’s six different luxe onsite restaurants, so there’s a cuisine to suit any mood. Try omelet and pancakes and/or bloody mary at breakfast-only Ulana, or the one-of-a-kind Japanese cuisine prepared by an award-winning chef at Kai Sushi. Meanwhile the beachside Burger Shack and the ‘Al ‘ono are prime for casual, tasty lunches (and great drinks). - Kids stay free! Children 16 years old and younger stay free when using existing bedding. - The following fees and deposits are charged by the property at time of service, check-in, or check-out. This is where luxury meets natural beauty. Near the rugged shoreline of tide pools and lava rocks bays, you’ll find some of Maui’s most upscale resorts. The last stop in West Maui, Kapalua is perfect for couples seeking a romantic escape.